This oil painting by Charles Courtney Curran (1861-1942) shows the Water Gate at the World's Columbian Exposition in Chicago, 1893. Here is a good example of the color of shadows, something that cameras can't capture as well as the human eye. The sources of light in shadow are very distinct: blue sky, orange ground, and white architecture, and there are white planes facing in all directions. The direct sunlight is coming from behind and to the right, making the illuminated surfaces a bright white. There are two main sources of light in the shadow: warm light bouncing up from the ground, and blue skylight from above. At letter (A), left, the upfacing shadow planes on the roof are receiving mostly blue sky light. (B) and (C) are down-facing planes. The light is mostly warm-colored bounced light from the ground. The far side of the arch (D) is getting very strong reflected illumination from the brightly lit opposite side of the arch, as well as apparently some greenish light from the water in the canal (not visible in this view) passing beneath the gate. At (E), the columns are a little bit lighter than other parallel vertical surfaces. They're projecting outward, receiving quite a lot of light from all directions, both warm and cool. It's possible that the columns appear bit lighter because they're a slightly lighter local color. According to an old description, the facades were made of "staff," a mixture of plaster, jute fibers, and horsehair, painted in cream and gold. The "White City" was torn down less than a year after it was built. 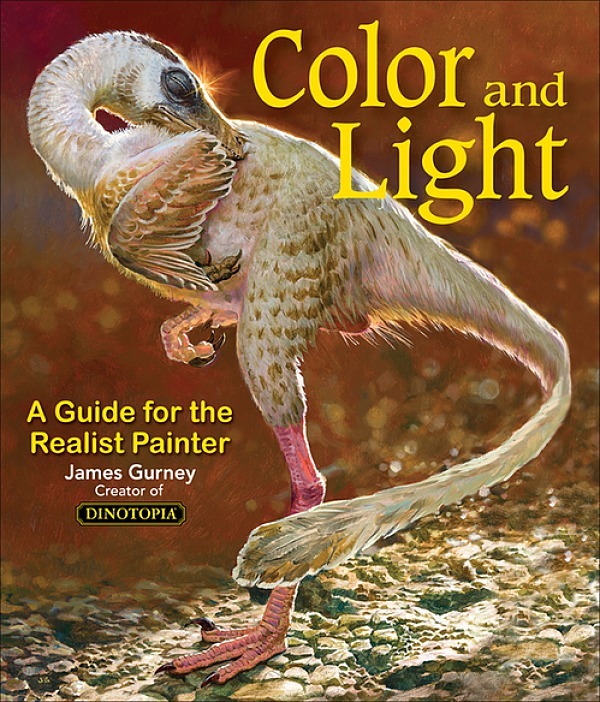 The topic of light in shadow is covered in my book Color and Light: A Guide for the Realist Painter, which U.S. customers can purchase signed from our web store. Color and Light is also available from Amazon. It's the ultimate gift for the artist in your life. 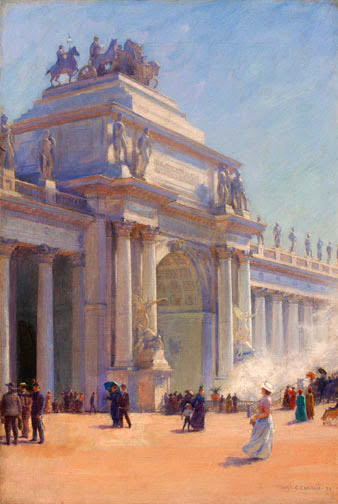 The Curran painting is a recent acquisition of Godel Fine Art. Godel will be represented at The American Art Fair, November 16th – 19th at the Bohemian National Hall, 321 East 73rd Street, New York. There's another scan of the image at Skinner Auction, where it sold recently. Some day, would you mind explaining this in a bit more detail: "Here is a good example of the color of shadows, something that cameras can't capture as well as the human eye."? I am not enough of a camera and light person to understand why they don't capture the color of shadows, and I have a strong suspicion that you have a way of explaining it so that I understand and learn. Susan, that's a good question, and someone would have to be more of an expert on both human vision and camera tech than I am to give you a really good answer, but I'll try. Cameras are getting more and more amazing, but I've noticed that they have a hard time capturing "accurate" color under conditions of extreme contrasts of brightness. Either the white burns out or the darks go to black. This is true of both analog film and digital sensors. New technology of high dynamic range (HDR) processing helps to combine information from different exposures, and there are all sorts of ways to boost color in a good digital capture. But I've noticed there's always a tendency for such boosted photos to become too garish -- that is, the chroma doesn't match up with our subjective human perception of color. 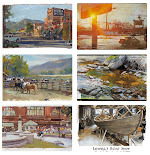 That's why anyone who has painted from observation often feels disappointed with the photos that they took on location at the same time, because they miss so much, even though they may have captured other aspects of the scene (such as the detail or texture) better than the eye can. As you can probably tell, I'm hugely fascinated by photography and video, and regard it as a useful supplement or enhancement to human vision, helping us see things in new ways. This is why the age old axiom, "Warm light = cool shadows. Cool light = warm shadows." has never made much sense to me. Your example shows that shadow areas are lit by reflected light, whatever the color of that light is will influence the color of the shadow. Or am I misunderstanding something? If anyone is interested in an a very thoroughly researched description of the Columbian exposition intermingled with a chilling portrayal of one of America's first known serial killers I can recommend "The Devil In The White City" by Erik Larson. Here's how to achieve really great lighting (RGL).